It’s been a while since we’ve posted, but that doesn’t mean we havent been busy! We’ve been actively rolling out our Android app for metered delivery and wanted to post a quick video to show how fast and easy it is for fdrivers to make deliveries. The app works the same for metered lubricants and supports electronic as well as mechanical meters. 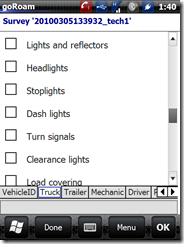 You can even use a truck that has a combination of electronic and mechanical meters. The driver selects a product to deliver and picks the meter they are using. The driver scans a barcode and goRoam validates the product (to prevent cross pumping/contanimation). Once validated, we wirelessly open the LCR solenoid (valve) to allow the driver to pump. The driver sees the meter values in realtime on their Android device – no more going back and forth to the truck to record meter values. 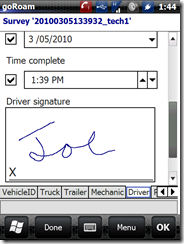 The driver can take a picture of assets or BOL’s (Bill of Lading) to attach to the order. They can add products or services such as demurrage or splits, and get an electronic signature from the customer…just like FedEx or UPS. Once complete, goRoam can print a receipt and/or email a PDF receipt so the customer has an electronic document of all assets fueled and their quantities within a couple of minutes of completing the delivery! We are often get asked for recommendations on mobile devices. If a client is looking at Intermec mobile devices, we get asked to help them choose between CS40, CN50, CN4 and the 70 series (CN70, CK70 etc.). We have customers using all models. This article will help explain what what you should consider when choosing and will highlight real-life customer examples for field data capture and proof of delivery applications. CS40 – smallest form factor, targeted at a size closer to a BlackBerry with a true integrated barcode scanner (not a camera scanner like the ES400, iPhone or Android devices). Small enough to comfortably use as a cell phone and slip into your pocket. CN50 – smaller form factor with solid ruggedness characteristics. Small enough to slip into your pocket but almost too large to use as a salesperson’s full time cell phone, although it would be fine for a technician to use given they usually have less talk time. CN4 – fully rugged device that replaced the CN3. The key upgrade from a CN3 is the addition of a camera. All CN3 accessories work with the CN4. Larger and heavier, designed to work in field conditions – rain, snow, mud, multiple drops to concrete, etc. The WiFi radio is designed to work in a warehouse or other environment where you may switch between access points (AP’s). CN70 – eventual replacement for the CN4. This is the most rugged, featuring an IP67 rating – you can submerse it in water and it will still work. This has the fastest CPU. Like the CN4, you can use it as a cell phone but it will likely not be a comfortable choice for extended phone calls. You can start to narrow the hardware choice by asking the following questions. How rugged a device do you need? If you’re making deliveries or have substantial outside or field data collection, you need to get a device with an IP rating designed for your environment. For instance, in fleet fueling you deliver fuel in the rain, snow, sleet or hail. The CN50, CN4 or CN70 would meet your needs. The CN70 is the most rugged. Our customers have had good success with the CN4 and CN50 in terms of rugged field use – surviving drops, rain and snow. The CS40 is better suited for more indoor types of use, such as a sales rep that needs to scan items to place an order. It will sustain drops to concrete and is more rugged than a consumer cell phone, but is not designed to be used in the elements. Do you need cellular data? If so, what cellular carrier do you use and do you know what the data coverage is like in your territories? The reason for this is simple – some territories like the North East are completely owned by a carrier (Verizon). If you want T-Mobile or AT&T coverage, you need to check coverage or consider changing carriers. All of these devices support AT&T, Verizon and T-Mobile; however, they will not get 3G speeds on the T-Mobile networks since T-Mobile’s 3G is a different frequency. While the cellular speeds on the CN4 are less than the other devices, it is still very fast and unlikely you would notice the difference unless you had large downloads or uploads. An of larger data would be taking 3MP pictures to upload. If this was a common occurrence, you may notice it but for most applications like Proof of Delivery, you would not notice a difference. Do you need to take pictures? If so, do they need to be high quality? If you need to take better quality pictures, you’ll want an autofocus camera (CN50 or CN70). The CS40 and CN4 have good quality color cameras but are fixed focus. For example, if you need to take a picture of a utility meter with the current meter reading (when replacing), any camera would be fine. However, If you need to take a picture of a utility pole where the distance is great, you would be better off with an autofocus camera like the CN50 or CN70. The CN70 has the highest quality (5MP) camera and provides autofocus. The CN50 is 3.1MP with autofocus. The CS40 and and CN4 are comparable but fixed focus. For basic pictures, the CS40 and CN4 should suffice for things like taking a picture of an asset you installed or delivered. For a comparison, most newer but inexpensive cell phones have 2MP fixed focus cameras. The iPhone 4 has a 5MP autofocus camera. GPS is built in to all of these Intermec devices. Accuracy is 3-10 meters. If you need sub-meter accuracy, you would need an external GPS device such as those from Trimble. Their cost can be greater than $2000/ea but obviously are needed when you do things like buried meter installations. All devices support Assisted GPS (AGPS), which helps by triangulating with cellular towers. It can speed up your GPS first time to fix and more importantly help with location when inside buildings. Do you need barcode scanning? All of these devices have barcode scanning. The only decision is whether you need 1D/2D or long-range. 2D scanners can be helpful if you have barcodes that may get dirty or damaged. Examples of this include plant nurseries where 2D barcodes may be easier to read due to dirt on the barcode. Long range scanners can scan barcodes up to 40’ away. Long range scanners are only available on the MC909x platform. Examples of long range scanning would be scanning the barcode at the top of a warehouse rack from a forklift. The CN70 has the newest, most advanced scan engine. Under most circumstances you may not notice a difference scanning between these devices, but if you have a very scan intensive application, you should consider the CN70. Will screen size impact your application? The CS40 has a 2.8” screen versus all others with 3.5”. While this does not seem like a lot, if your application requires a lot of screen interaction or signature capture, you would notice and appreciate the larger screen. Other than the CN70, all devices have a 240×320 resolution. The CN70 has a VGA 480×640 resolution. This means for things like photos, you would notice the better screen. 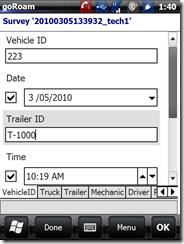 For standard field data collection, you may not notice the difference. The CN70 uses Gorilla Glass for the screen, so it is the most durable. So which device is right for you? 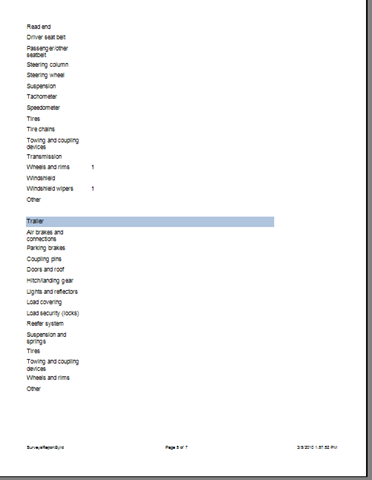 The following highlight examples of BizSpeed customers using each type of device. 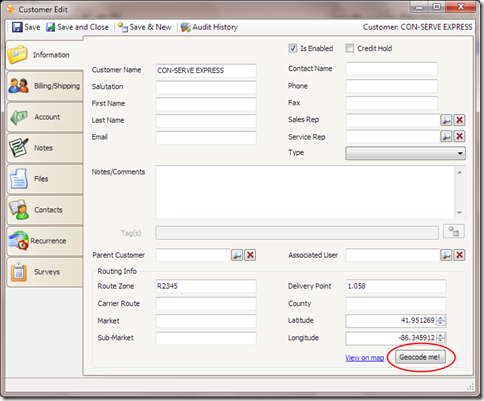 CS40 – customer order entry. A distribution customer places devices at their customers’ locations to let their customers scan item UPC’s and place orders. Their primary interest was getting the lowest cost device with a solid scan engine. They considered both the CN50 and the CS40 and selected the CS40. They use a dialup modem and did not need cellular, camera, GPS or WiFi. CN50 – Pharmaceutical HazMat pickup. A Hazmat customer places devices at their customers’ locations (pharmacies, hospitals, nursing homes) so customers can scan items into bins to be picked up, tracked and disposed of according to EPA and FDA regulations. The items, pharmaceuticals and medical equipment, usually have UPC or similar barcodes. They considered CS40’s and CN50’s. The CN50 was selected due to the larger screen size and larger keyboard than the CS40. CN4 –Fleet fueling and bulk product delivery. This customer provides fleet fueling to customers like Coca-Cola, Staples, 84 Lumber, Waste Management, etc. Their customer’s trucks are parked in their yards overnight. They use our goRoam.FuelSales module to scan each truck they are fueling, confirm the correct product (on-road vs off-road diesel for example) and then pump fuel into their customer’s vehicle. The handheld wirelessly reads the fuel pump meter to record the quantity per vehicle. They deliver in rain, snow, cold and hot temperatures. They considered the CN50 and the CN4. They selected the CN4 due to it’s better IP/ruggedness rating, bigger backlit keyboard, more powerful wifi radio (for communications with the truck meter) and better truck mounted vehicle cradle. At the time, the CN70 was not available. If you have questions or comments, please feel free to contact us regarding rugged mobile hardware selection. 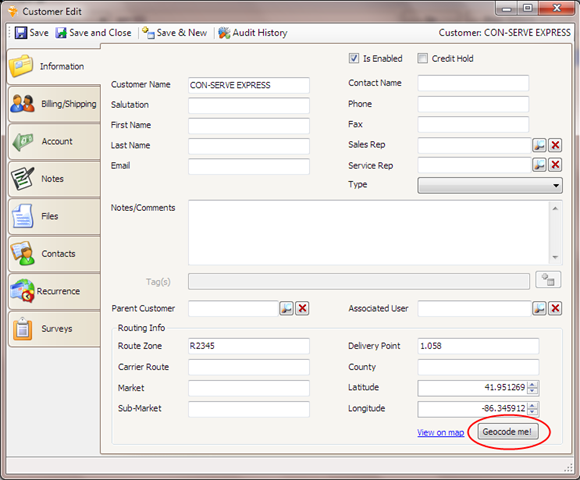 To learn more about BizSpeed and goRoam Proof of Delivery Software click or call 866-270-0541 (toll-free). You’re a snow plow driver. Instead of receiving a route on paper, imagine getting into the cab and turning on your GPS unit. You simply select your route and the GPS navigates to each turn AND lists your instructions like ‘salt left lane’. BizSpeed’s Navigation Service for Routes makes it easy for public works and snow plow companies to get your routes on a Garmin GPS. You simply scan, fax or email us your routes. We’ll convert the routes into an electronic route for your GPS units. We can pre-load and send the routes on an SD card, or you can download them from our goRoam SaaS service. We even provide map files so you can view your routes on a map, like the one shown below. The Garmin solution is low cost and easy to use. When you’re ready to add more capabilities like wireless dispatch, inspections, 2-way messaging and GPS tracking, you can move up to our goRoam product that runs on rugged terminals like the Motorola MC55 and Intermec CN50. 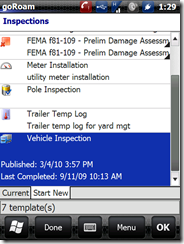 FEMA and related agencies collect significant amounts of data in the field on paper forms. 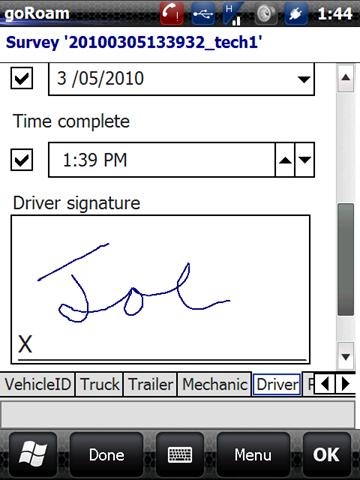 Paper forms introduce delays, require re-keying and do not integrate key data like pictures and GPS. This video shows how to take a paper FEMA form and convert it to an electronic mobile form on a Windows Mobile Device. Federal and State Emergency Management Agencies need to collect a lot of field data and they need to quickly and easily assemble that data. This video shows FEMA and State EMA officials how easy it is to turn paper forms in to mobile forms. Click here to learn more about goRoam for Inspections and Surveys for mobile forms, or contact us. Customers have continued to push the MobileHub (SiteSupervisor) to automate business processes, especially after mobile form data is posted. We’ve enhanced the goRoam.MobileHub to provide delayed jobs (background processing). This is best suited for actions where the user does not need an immediate response so you can keep their workflow streamlined. Delayed jobs are installed with the ‘scheduled job’ administration tools. Delayed jobs are setup in a separate library on a per company basis. This allows our SaaS (Software as a Service) customers to each have their own delayed job processor, or if you are an on-site customer you can run background tasks with one library for all company codes. Please contact your account representative to learn more. 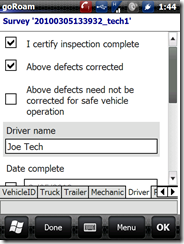 DOT regulations require all commercial vehicle carriers to complete a Driver Vehicle Inspection Report (DVIR). Inspection reports must be completed both pre-trip as well as post-trip. For more information on Federal Motor Carrier regulations click here. 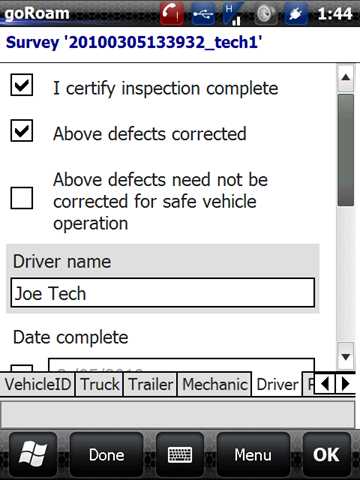 Our inspections module is setup to enable electronic vehicle inspections so drivers can complete and print DVIR’s from handheld mobile devices such as Intermec CN3’s and Motorola MC55’s. 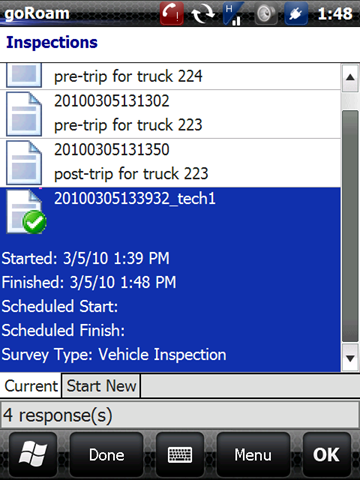 Vehicle inspection reports are wirelessly sent to the goRoam.Mobilehub server so fleet maintenance can see all reports in near real-time. 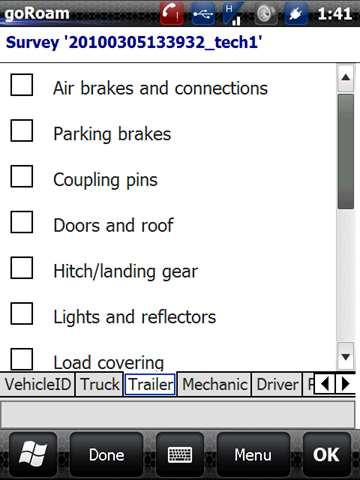 More importantly, we can enable post-save events so you can specify actions upon receiving electronic vehicle inspections. 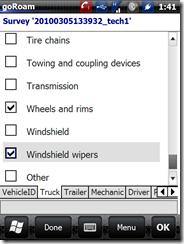 For example, you can receive an email anytime an inspection is completed with a defect, or you could receive an email and automatically create a work order for that vehicle. goRoam.Inspections allows you to easily tailor the vehicle inspection for your specific needs and questions. 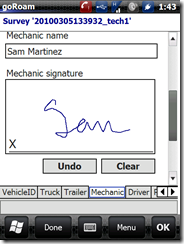 The following flow shows a typical vehicle inspection flow for a driver. 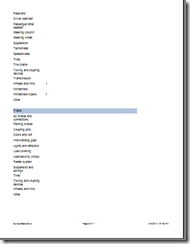 Step 1 – Login in and view list of available forms. 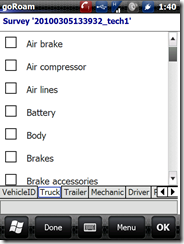 Select vehicle inspection from the list of available electronic forms. You can take a picture directly in the inspection form and mark on the picture to show where the problem areas are. 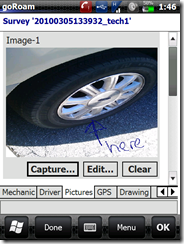 Forms can be GPS stamped in the background so you know exactly where the inspection took place. 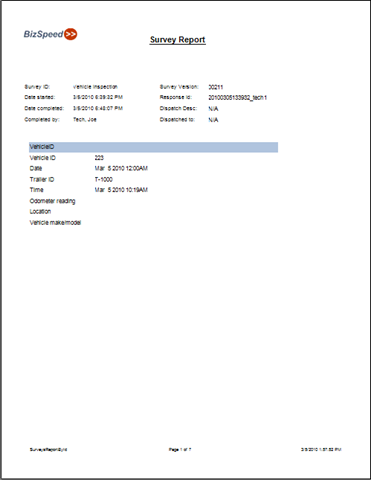 Once completed, the inspection report is automatically sent to the server via cellular or wifi. 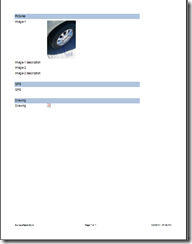 The driver can print a copy to a local printer such as the Zebra RW420 or email a copy. Note that the start and stop time were automatically set, so you know exactly when the driver started and stopped. 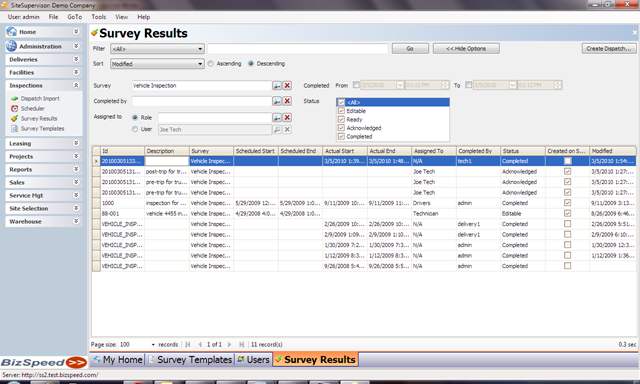 All inspections are automatically sent to the server where you can view, report or export results. 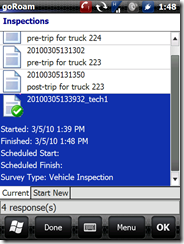 The submit process can be configured to automatically send an email when certain inspection fields are set or have a value (such as low oil or air pressure). The following standard report is available for all surveys. 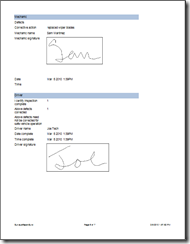 Report templates can be easily setup for your forms to condense the report to one page. 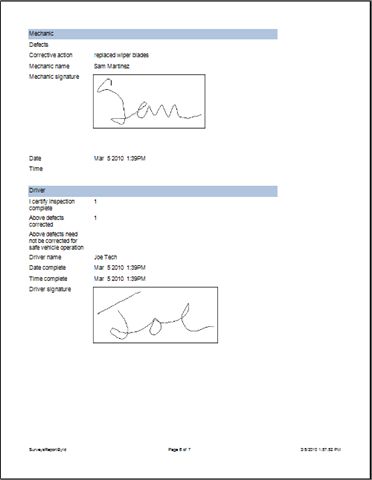 Note the report contains the full electronic signature, picture of the vehicle with markup from the driver on the defect and GPS location. 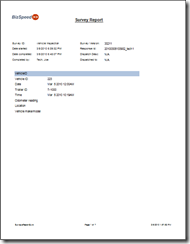 Reports can be saved as PDF’s for easy emailing. For a demo of new features, please contact us. A key step in managing service and delivery organizations is knowing where your customers are. In addition to our batch customer geocoding tools, we can geocode individual customers, view them on a map, and view groups of customers on a map. goRoam.MobileHub users can simply load the customer edit form and click the ‘geocode me’ button to get a geocode based on the customer’s address. As always, you can enter detailed routing as well as tags. 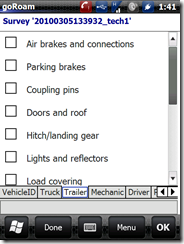 One or many tags can be assigned to a user to allow grouping and sorting according to your business rules. We have also added a new ‘Customer Map’ control that takes advantage of geocoding to select groups of customers and view them on a map. The typical use would be to view and confirm customers by route, delivery sequence, tag, city, etc. Notice that you can select one or many customers to view. 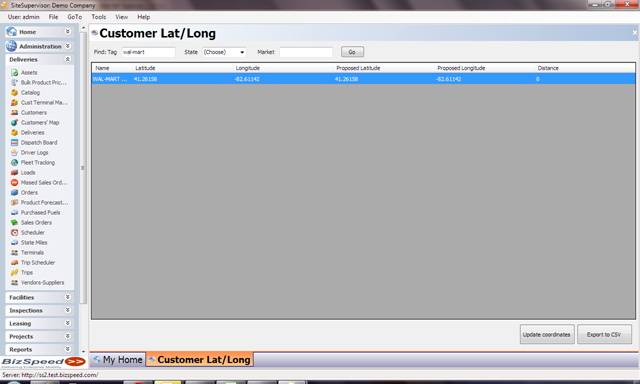 When you move your mouse over a customer, the customer details are shown. 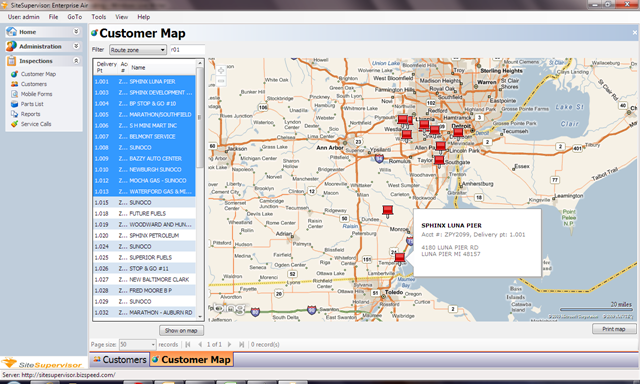 Note that the customer map can be printed. For customers who need more accurate geocodes than street maps provide, we have added the ability to synchronize goRoam mobile deliveries with vehicle GPS systems such as GEOTAB. This is important when you have a customer’s geocode at the street address, but in fact deliveries and service are away from the street. For instance, with customers such as Wal-Mart or HomeDepot, the typical geocode is at the street but service and deliveries are at the back dock which may be 400+ yards away. If you set a geofence alert at the street, you will not have accurate alerts or time on site reports. We now support this in batch for large scale GPS geocode updates/corrections. Customer GPS coordinates can be updated in batch or exported to a CSV file for other applications. 5 technologies have proven to drive reductions of 30% of total distribution costs versus manual systems for bulk companies, resulting in less trucks, less labor hours, and fewer miles. Your competitors have used these technologies to get more stops per day, optimize keep-full delivery and increase gross margins 2-4%.